From north Motorway Lyon-Marseille, exit Tournus, through Ozenay, Chardonnay, Lugny, S. Gengoux to Azé, signposted. From south Motorway Lyon-Marseille, exit Macon Nord, through Verchizeuil and Ige to Azé. Open: APR to JUN daily 10-12, 14-19. JUL to AUG daily 10-19. Fee: Adults EUR 7, Children (6-16) EUR 4, Children (0-5) free, Students EUR 5. Groups (20+): Adults EUR 5, Children (6-16) EUR 3. 1963 massive formation broken which blocked the passage, continuation discovered and excavated. 1982-1985 excavationn of Aze 1-3 by Alain Argant and Jaqueline Argant. 2004-2006 dating of speleothems by Barriquand, Barriquand, Guillot, Nykiel. 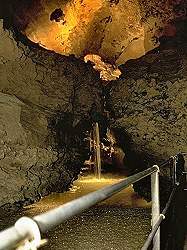 Image: The river (lower) level of the cave. The Cave of Azé was named after the nearby village of Azé. It is located close to the village at the foot of a limestone hill. There is actually a cave system, and there are two different caves, one above the other, which are visited. The whole system has four Levels. 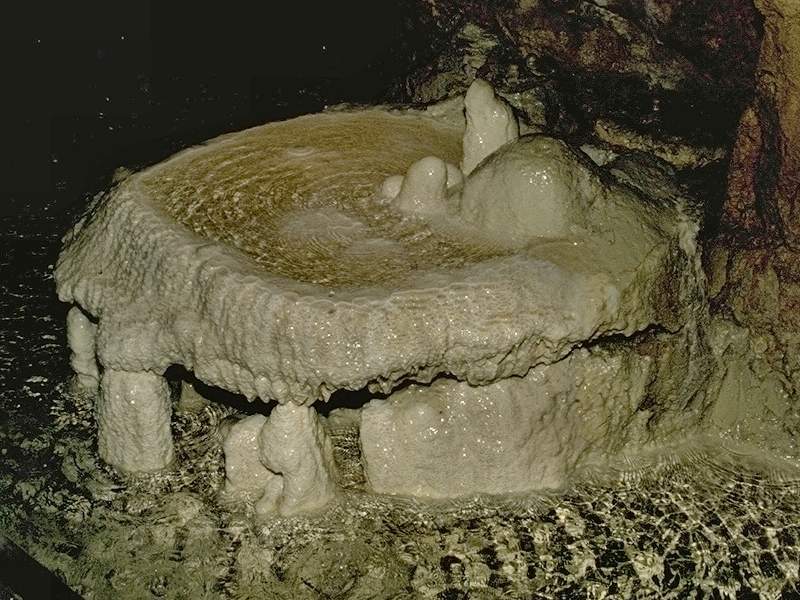 The top level is the fossil part of the cave and has been accessible for many thousands of years. It was frequented by animals, stone age man, and Romans. The second and third level are very close together, sometimes the floor has collapsed and there is only a single passage. This part of the cave system has no natural entrance and so no remains of animals or man were found here. 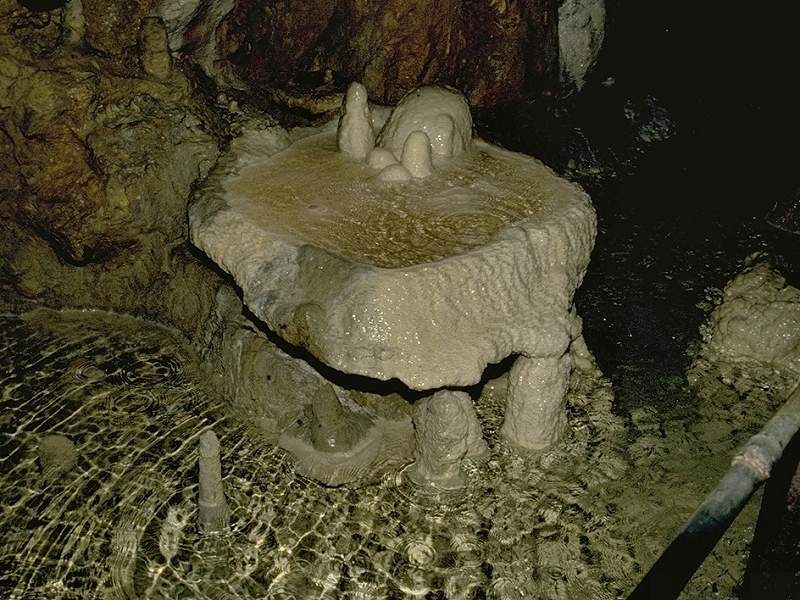 The third level is an active cave, which means there is a river. The bottom level of the cave is completely flooded, it is accessible only to cave divers. The tour starts with the uppermost level, which is entered through a iron bar gate in the huge portal. The natural entrance to the cave was open for several ten thousand years and was frequented by animal. So the remains of many species, including cave bear, cave lion (Pantera spelaeus) and hyena were found here. Later the hunters of the Ice Age lived here and left tools and drawings. The usage of the cave by man continued, for example during Roman times, which is proven by the remains of a Roman wall. 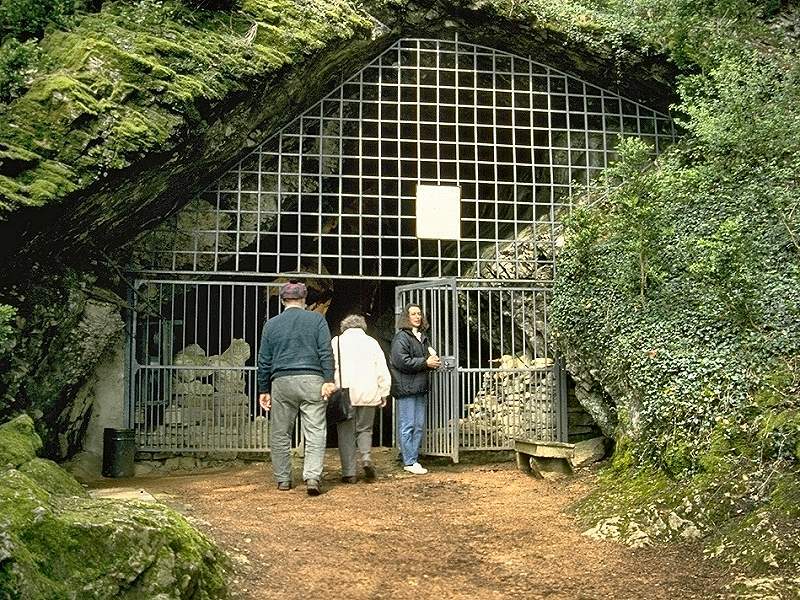 It was built between 275 and 300, when this cave entrance was used as a storage room. At this time the cave floor was filled with several meters of cave sediment, containing debris, clay, animal bones and human remains. This floor was excavated during the 19th century, and many finds are now on display in the small museum at the cave entrance. But because of the excavations the floor is now much lower and the Roman wall, once built on the floor now hangs below the ceiling. It had to be fixed with an iron bar to prevent a collapse. 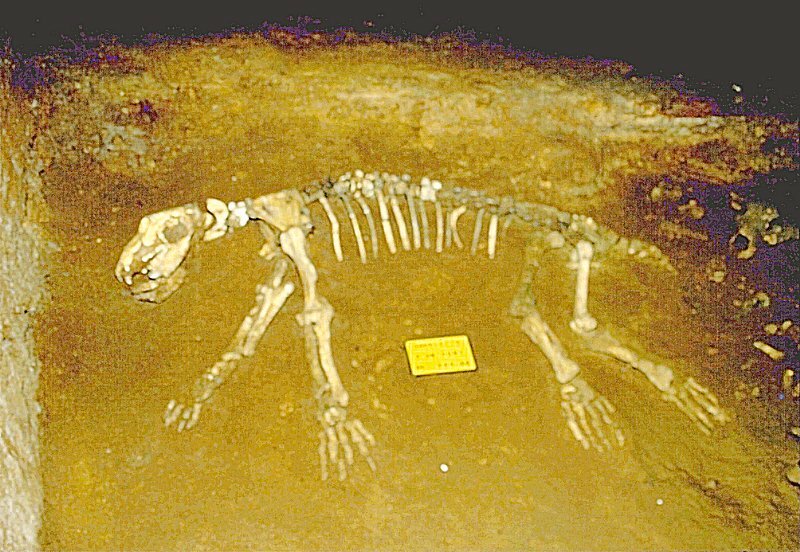 Numerous bones of cave bears, which were found during the excavation, were removed to museums. Some are on display in the small museum at the ticket office. One complete skeleton is on display in a corner of the big hall. The skeleton is lying on the ground, the bones were ordered in the correct way but were not reassembled. During a more recent excavation between 1982 and 1985 about 200m inside the cave in an area of 16m² more than 1,000 cave bear bones belonging to at least 44 indiviuals were found. Also the skull of a cave lion (Pantera spelaeus) and bones of Vulpus vulpus were discovered. The bones were dated to be of late Pleistocene age by the analyzation of their forms. This was completed by a very recent dating of speleothems. There were no speleothems in the area of the excavation, but a nice formation in some distance was dated and it was possible to correlate it with the different layers of the excavation. The excavations are still ongoing and numerous interesting palaeontologic discoveries were made during the last years. A side passage was discovered and partly excavated which contained six different levels bearing fossils. 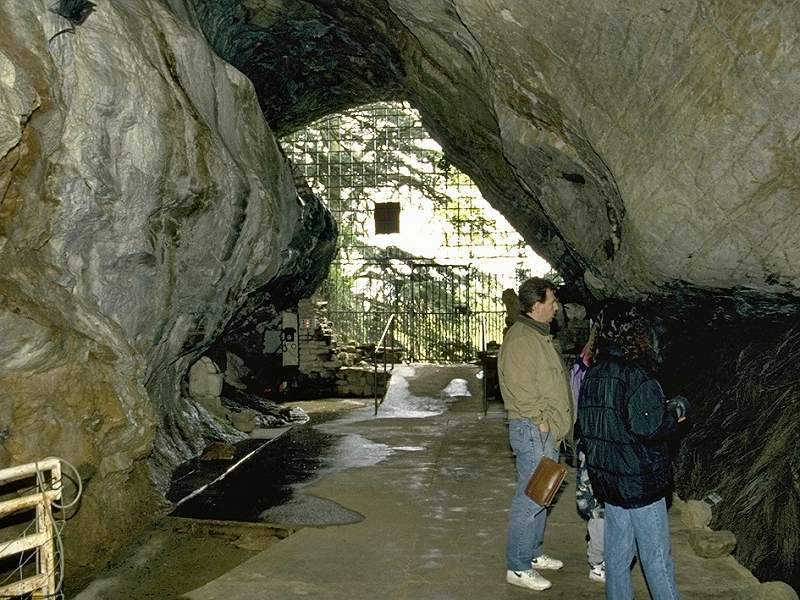 After the visit to the upper level, the tour leaves the cave through the portal and proceeds to a small door on the hillside right below. 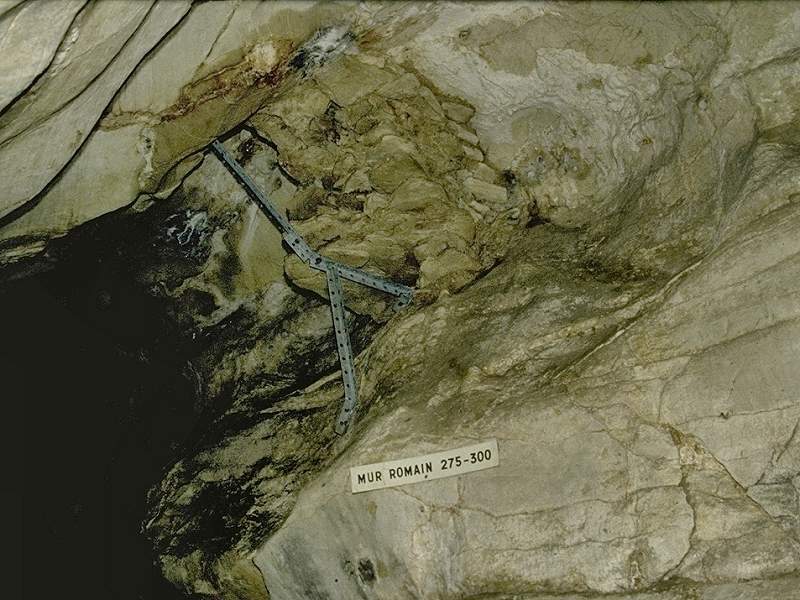 Here the second level of the cave is entered, showing wild river passages and dolly tubs. At some point the second and third level meet and the tour returns through the third level. 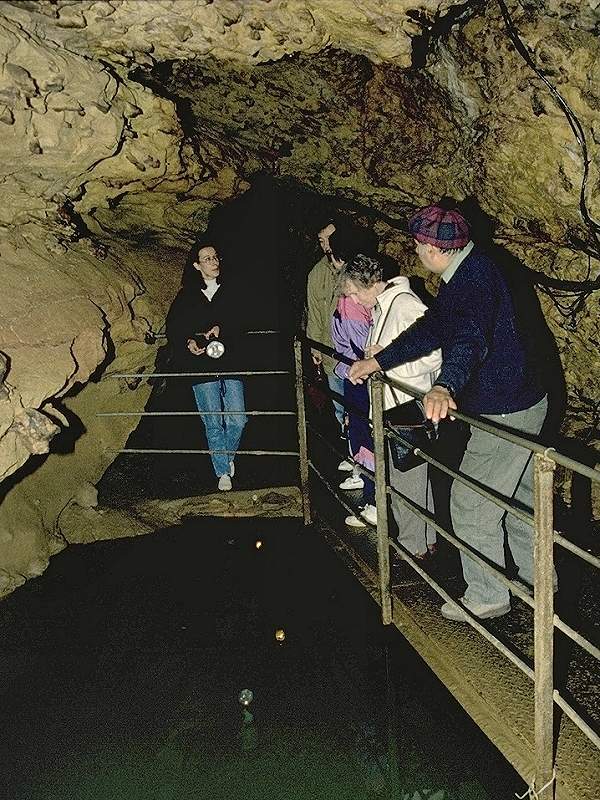 Here the visitors follow the path of the cave river most of the time. The paths were built right above the water level and get flooded in spring. The river vanishes into a swallow hole close to the cave exit. The final stop of the cave tour is outside. After leaving the cave from the third level, it is only a few steps to a romantic resurgence. This is were the cave river reappears and it is also the access to the lowest level of the cave. Of course, this part of the system is accessible only for cave divers. 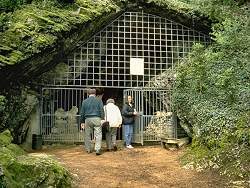 Search Google for "Grotte d'Azé"